Ron Kujawski can be rightfully described as the founding father of the Western Massachusetts Master Gardener Association. It is questionable if WMMGA would ever have been born without his enthusiasm, vision and initiative. 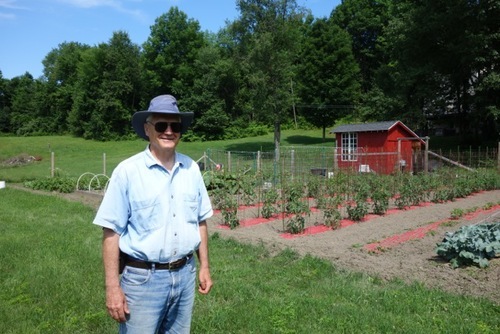 Ron, now retired from a long and active career in horticulture and environmental work, shares a quarter-acre garden with his daughter, Jennifer, at her home in West Stockbridge just yards away from the New York border. It soon became apparent why Ron chose to meet there. He simply loves his garden. I asked Ron to tell me about his garden. Forty-five minutes later we got to my second question. Starting with asparagus and ending with zucchini, the Kujawskis have bountiful variety in their beautiful, sunny garden that is bordered by meadow and the railroad tracks headed to Albany. "We grow what we like," Ron explained. Among other things this includes asparagus, cucumbers, squash, corn, lettuce, okra, horseradish, rhubarb, strawberries, several varieties of peppers, two varieties of shallots, three varieties of potatoes, five varieties of peas, eighteen varieties of tomatoes and an amazing thirty-two varieties of garlic! More about that later. "We are already starting to dig new potatoes. This variety is Red Norland that I really like for a new potato. We just dig around and pull potatoes and leave the plant intact to continue to develop." The Kujawskis have potatoes well into the winter as well as many other vegetables. During the season Ron estimates that once the garden starts producing, 70-80% of their meals come from it. Besides eating fresh from the garden they can tomatoes, green beans, and rhubarb, freeze peas, and keep shallots and potatoes in the basement. They even have fresh leeks out of the garden until Christmas by mulching them with straw in the fall. Ron grows shallots instead of onions because they keep better, and if they have a surplus, they sell some to area caterers to help pay for fertilizer and seeds for the garden. They even used to sell shallots to the local restaurants, but that stopped when Ron went to work for University of Massachusetts Extension where he spent most of his career. Ron mixes his eighteen varieties of tomatoes in rows. Some are disease resistant and some aren't. After experimenting with stakes and just letting them sprawl, he's found that cages offer the best support structure. As a scientist Ron likes to experiment and keeps up with the literature. He's determined that red plastic makes the best mulch for tomatoes as well as their cousins eggplant and peppers. "With red plastic infrared radiation transmits through it. Black plastic absorbs the infrared and eventually transfers it to the soil. So you have a better warming effect with red plastic. Then you have the red light reflection that promotes flowering and fruit set." He found from experimenting that tomatoes grown with red plastic mulch were darker green with thicker stems and were more productive. Ron thinks darker green may mean there is more photosynthesis with the red plastic because of the light reflection. "It's certainly made a difference." Okra also responds well to the red plastic. "I always struggled to grow it, and now with the red plastic I get tall plants that are loaded with the fruit. It's the same thing with eggplant. Once I started using the red plastic, it doubled in production." 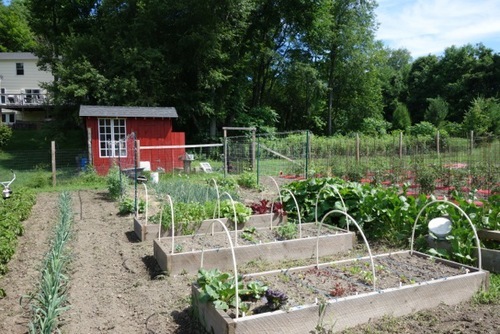 On the other side of the garden separated by a grass path, the Kujawskis grow mostly small fruits--blueberries, strawberries, and raspberries as well as corn and vine crops--winter squash, summer squash, and melons. The squash is grown in black plastic although Ron prefers green plastic because research results indicate it works better for vine crops. And blue is good for cucumbers. Ron buys 600' rolls of plastic from commercial companies because it's cheaper than the 25' lengths sold at garden centers. Rolls are 4' wide, but he cuts them in half lengthwise to cover 2' wide rows. He finishes the garden with straw mulch between the rows for weed control. Ron has a passion for garlic. "The interesting thing about garlic is there are hundreds of varieties out there being sold, but USDA did a genetic analysis and found that there are only eight strains. But I think why we have so many different varieties is because garlic has different characteristics depending upon where it is grown based on elevation. So a variety that I have growing here would be different if I gave it to you and you grew it in Colorado at a higher elevation. Plus I save some bulbs to plant from year to year, and I have two varieties I received from friends who didn't know what kind they were. I got one from an Italian farmer in Pittsfield, and he didn't know what it was. He said it just came from the old country. And I imagine when you go to a garlic festival, you'll see some varieties that are named that after the farm or someone's dog. So you do see different sizes, different widths of the leaves, different scapes, but there are really only eight strains." There are different tastes to garlic varieties, too. Roja is as spicy as a hot pepper. German white are very mild. Most of the garlic at the market comes from either California or China. China is currently the biggest producer of garlic in the world. There are also hard-neck and soft-neck garlic varieties. Hard-neck garlic has a long, stiff stalk called a scape growing out of the bulb. They produce fewer but larger cloves. Ron grows mostly hard-neck garlic because it is hardier for growing in colder climates. "The garlic thing is kind of an obsession. I can tell you I have four or five varieties that I really like, and that is all I would need to grow, and I would be perfectly happy. But it is kind of a hobby. So we go off to the garlic festival and see something I don't have, and I try it. I've discounted probably a dozen varieties that I don't like over the past few years, but I still have thirty-two!" Ron has thought of starting a dried bean collection as well because he finds some of them so interesting, but the ones they grow mainly are black turtle, red kidney and great northern. They plant six rows of dry beans--black, white, red, orca--and save 1/4 lb. of each for planting the following year. They pick them and hang the plants to dry in their garden shed at their home in Great Barrington. Then they bag the dried pods and shuck them in the evening while watching a movie. "It's one of these mindless tasks. I actually enjoy it. I've taken pictures of bowls of all these different colors of dried beans. They're so pretty. It's tactile and visual stimulation. It's interesting." Ron starts seeds in the basement where he's set up benches, heating mats and florescent lights. Then he moves the seedlings to benches in the sun room where there is minimal heat. As the weather improves he sets them out on the deck before moving them to the garden under row covers. "My daughter and I make an annual trip to Andrew's Greenhouse in Amherst every May mainly looking for annual flowers that she puts in baskets and things, and I'll see something, a new variety that looks so good. So I have a couple of varieties I got from Andrews, but just about everything else we start ourselves." The Kujawskis plant a four-year crop rotation. Potatoes, tomatoes, peppers, eggplant will be replaced with corn next year and so on. They like to experiment and try new things and methods. This year they staggered planting cabbage, broccoli and cauliflower. Instead of planting them 18" apart in rows 36" apart as recommended on the packets and used in commercial agricultural production, they planted them closer. 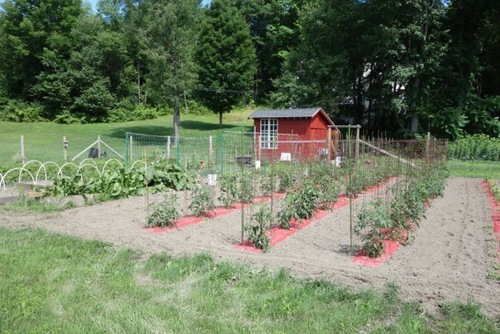 Ron built a grid with two pieces of wood crossed in the middle to plant everything 18" apart. He put the grid on the ground and planted a seed at each point so everything is 18" apart. This method resulted in triple rows within that space. He also uses double-rowing with peas and onions so they are 8" apart. Ron's also done some experimenting with corn. Like many gardeners he's been fighting an on-going war with raccoons. "I tried everything, even wrapping individual ears with chicken wire. Nothing ever worked. But last year my daughter had some sunflower seed she asked me to plant, and I put them next to the corn. I had no problem at all with raccoons. So I'm doing it again this year to see if it works again. Was it just dumb luck, or maybe they felt sorry for me?" Ron does succession planting of the lettuces, dill and carrots. He likes to plant carrots in raised beds because they do much better, growing longer and straighter, planted in deeper conditioned and cultivated soil. Ron uses row covers for frost protection in the spring only. They usually harvest everything they need from the summer crops before the frost comes so fall protection is unnecessary. During the season he trenches plant residue and plants buckwheat, Egyptian clover or Sudan grass as summer cover crops. These die with the frost and are turned under along with the straw mulch and plant residue. Then he plants winter rye in the fall. "Turning in all this organic matter builds up the soil. This used to be very poor soil, very gravelly, but each year it just gets better and better. We don't compost because of the black bears around here." Ron admits he couldn't manage his large garden without equipment. He owns a 7-hp Troybuilt for tilling up the garden and uses a smaller tiller for going between the rows. Those save time and energy, but they still spend a lot of time on their knees hand-weeding. Unlike many gardeners Ron actually enjoys this. "Late here in the evening it's so quiet, I can hear the birds. It's so peaceful and beautiful. I saw a black bear walking along the tree line the other evening!" In the winter when Ron and his wife, Pat, go to Florida they bring their son canned goods and dried beans. "Our daughter-in-law, who's from Florida, has a great recipe for red beans and rice." Thinking ahead to next year Ron plans to get back into strawberry and raspberry production putting in trellises where the corn is now and doing raised beds for the strawberries. He may plant grapes as well and wants to do espalier for some dwarf fruit trees. Ron's interest in gardening is in his blood. He came from a family of sharecroppers and grew up on an onion farm in the village of Florida in Orange County, New York. After school Ron worked in the onion fields after a 4:00 dinner until the fields were dark. They worked all day Saturday, all day six days a week in the summer, and even on Sundays if they needed to harvest lettuce. After high school Ron studied Biology at University at Albany SUNY where he earned his Bachelor's, Master's and Doctorate degrees. His first job was developing the Environmental Studies program at Simon's Rock College in Great Barrington. He did that for five years and graduated the first majors in the program. Concurrently, he was teaching workshops for University of Massachusetts Extension Service and found he really enjoyed that audience more than the college students. He indicated his interest if a position became open and was later hired as a Community Resource Development Specialist. He worked with communities on forestry and environmental issues. 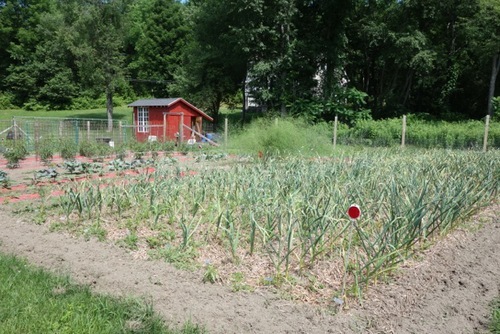 He also started developing community gardens in the North End of Springfield and helped the agricultural agents answer questions under the home horticultural program for Hampden County Extension Service. The latter helped to take the pressure off the agents who answered the home gardening questions that came into that office, but with increased interest in gardening the number of questions grew beyond control. The administration at the University of Massachusetts decided to start an extension gardener program, but because it was a top down decision, not everyone bought into it. Within that program Ron conducted training in Waltham with three or four volunteers, but it only lasted two years. But things got even busier and bigger and something had to be done. Ron knew about the Master Gardener program started in Washington state and had friends in New York and Connecticut who worked in their MG programs, but he didn't like the way those programs went. He visited several offices in other states to see what worked in their programs and built a program around those elements and a few other ideas. He wanted the program to be selective to avoid bringing in people from the agricultural industry who wouldn't volunteer after their training. It should include an interviewing process where applicants would be informed that the MG was a volunteer organization but volunteering was a job. "If you have a commitment, you have to be there. It's a job you're not being paid for. It seemed to work pretty well." There was also the academic element including lectures, quizzes and tests. Ron was fortunate to get other extension agents and university faculty to do the training. The program was an immediate success. People came from all different walks of life--lawyers, dentists--but they were all enthusiastic and committed. It became a social outlet as well with barbecues and field trips and served as a model for starting other groups across the commonwealth. However, the Extension program suffered a budget cut, and the home horticulture program and the master gardening program along with it was slated for elimination. The core group that developed WMMGA met around the table and decided to form a private non-profit organization. They wrote a constitution and filed for incorporation. Ron stayed with the process to see it through and to work with the University of Massachusetts on the training aspect. Ron believes WMMGA's success is directly due to the enthusiasm of the people involved in it. "I've come to the conclusion after being retired that it was the most satisfying thing that I did. It's become something way beyond what it was initially. It's much broader, wider and deeper than I think it would have been had it stayed within the University because there are always constraints. Going private allowed the Master Gardeners to just run with it, and what it is now is just amazing." Ron was rewarded for his efforts with a well-deserved lifetime honorary membership in the WMMGA. Ron believes the strength and value of WMMGA is that it represents people who are innately enthusiastic about gardening and plants and possess a willingness and desire to share that with other people. "It's sharing knowledge you've accumulated with other people so you are creating more gardeners and more appreciation for gardening and nature among other people. That to me is the biggest value of the MGs." Ron hopes the organization continues to grow with links to other similar organizations such as the Berkshire Botanical Garden, Hampshire College, and the Massachusetts Horticultural Association and trips such as the one to England this summer. "I'm very proud of the MGs and what they've done. I never envisioned how far the program would go and the variety of things the MGs do. There was always that fear once they went private that it might not last. It not only lasted. It grew!" Ron has answered his share of unusual questions during his career, many of which have little to do with gardening. He recalled a man who called about a praying mantis that jumped into his salad at the dinner table. For some reason he thought it was pregnant and wanted to know what it wanted from his salad. Too late after the call Ron came up with a great answer. If the praying mantis was indeed "pregnant", she probably already ate her dinner--her mate's head! Another odd question came from a man who was concerned about the mysterious disappearance of a duck. Apparently, a duck and drake pair settled on his pond that spring, and the man was anticipating the joy of eventually seeing ducklings paddling behind mom and dad. Soon after the pair moved in another drake arrived and starting hanging out with the first drake. A few days later the duck was no longer to be seen. The man was convinced that the second drake was gay and had killed the duck! He wanted to know how to get rid of the gay drake. Ron maintained his professional demeanor and suggested the man call Fish and Wildlife. In 2010 Carleen Madigan, an editor at Storey Publishers in North Adams who knew Ron from his lectures, asked him if he would like to write a book about vegetable gardening with his daughter Jennifer. Due to the economic downturn there was increased interest in home gardening, and Storey needed a beginner's gardening book to offer. Though reluctant at first because both Ron and Jennifer thought there were already too many gardening books available, they eventually agreed to write the book. Their book proposal for Week-by-Week Vegetable Gardeners Handbook was enthusiastically accepted, and Jennifer and Ron wrote the first draft in a couple of months. Jennifer's editing experience helped immensely to ease the writing process. They asked for line illustrations rather than photos to go along with the text because they thought they would be more instructive. 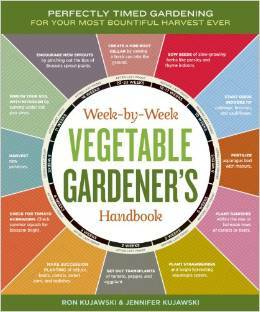 The book provides a weekly to do list for gardening tasks throughout the season with detailed instructions about how to do everything from planting tomato seeds to harvesting pumpkins. Ron found working with Jennifer a good father-daughter bonding experience, and the book continues to be a best seller for Storey Publishers. As if his huge garden is not enough to keep Ron busy, he's engaged in a host of other related activities. He continues to write two columns every week for the Berkshire Eagle and the Massachusetts Nursery and Landscape Association's home gardeners website. He still does some scouting for UMass and the weekly Landscape Message written by Ellen Weeks. He lectures at WMMGA, other organizations, symposia, garden clubs and the like. Storey Publishing sometimes sends him books to review and comment on for content. He is revising the Massachusetts Nursery and Landscape Association training manual. He volunteers at Massachusetts Audubon, BBG, and the community soup kitchen. Plus he does a bit of consulting. "I think some weeks you are busier than when you were working. It's a little disorganized because you are always doing something different. I'd like to spend more time here at the garden, but there are just a lot of things going on. I really don't have any down time, but I'm content. I love being in the garden. More than anything else I love being here. I love crawling on my hands and knees weeding. Part of that satisfaction comes from the solitude and tranquility when you are weeding but you are making progress, too. It's like painting. You can see what you have done."